Today, the Fourth is definitely with you as Syfy reveals the first wave of cameos and the official movie poster for Sharknado: The 4th Awakens, premiering Sunday, July 31 at 8PM ET/PT. 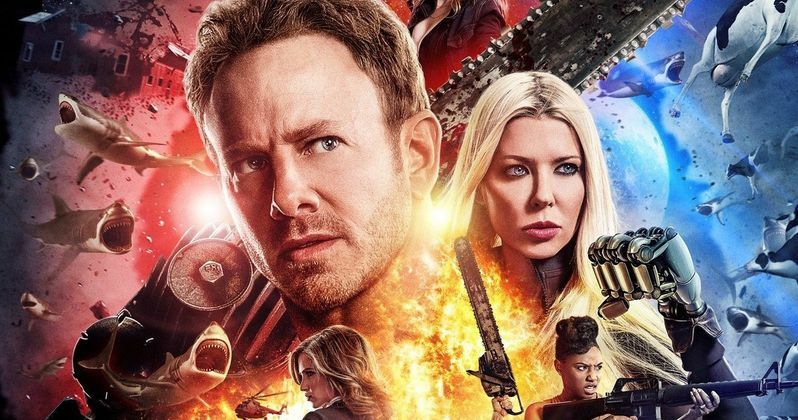 With sharknados back in full force, it's only natural that Fin Shepard (Ian Ziering) would need to enlist help from some new friends in his tireless fight to protect the world from the sharknado menace...Take a look at some those making cameos in The 4th Awakens this summer, in alphabetical order. Syfy has revealed that Cynthia Bailey (The Real Housewives of Atlanta), Robert Herjavec (Shark Tank), Kym Johnson (Dancing with the Stars), Carrie Keagan (TV host), T'Keyah Crystal Keymah (In Living Color) and Baywatch stars Gena Lee Nolin and Alexandra Paul will play Astro-X rocket scientists and astrophysicists. Benjy Bronk (The Howard Stern Show) will play a morning show host, Duane Chapman (Dog the Bounty Hunter) is appearing as a chainsaw dealer and Stacey Dash is portraying the Mayor of Chicago. Rascal Flatts' Jay DeMarcus is playing the manager of the Shark World hotel, while David Faustino (Married with Children) is portraying a Las Vegas gambler. Lori Greiner (Shark Tank) is also playing a home shopping guru, while MMA fighter Frank Mir is playing head of security for the Shark World hotel. Dr. Drew Pinsky (Loveline) will play a pastor, Patti Stanger (Millionaire Matchmaker) cameos as a reporter while Slipknot's Corey Taylor plays a Shark World hotel security guard. Vince Neil (Motley Crue), Wayne Newton (aka Mr. Las Vegas) and Todd, Savannah and Grayson Chrisley (Chrisley Knows Best) are playing themselves. Stay tuned for more cameo surprises to be announced! Sharknado: The 4th Awakens takes place five years after the East Coast was ravaged in last summer's Sharknado 3: Oh Hell No!. Fin (Ziering), his family and the cosmos have been blissfully sharknado-free in the intervening years, but now sharks - and 'nados! - are being whipped up in places (and ways) least expected. Tara Reid is also set to return as April Wexler to reveal the outcome of the fan-voted #AprilLives or #AprilDies social campaign. The poster seems to tease that she is getting some robitic limbs to become an April Cyborg. David Hasselhoff (as Gil Shepard) and Ryan Newman (as Claudia Shepard) will also reprise their Sharknado 3 roles. New additions to the Sharknado: The 4th Awakens cast include Gary Busey, Tommy Davidson, Imani Hakim, Cody Linley, Masiela Lusha and Cheryl Tiegs. Sharknado: The 4th Awakens is a production of The Asylum. Anthony C. Ferrante returns to direct an original screenplay written by Thunder Levin. Take a look at the new poster for Sharknado: The 4th Awakens, and stay tuned for flurry of /shark-exorcist-trailer/Great White Sharks as we get closer to the July 31 premiere on Syfy.